For my Mother's birthday, I've created a card with vignettes from the In this World stamp set by Stampin' Up! Almost all the ink is the new Ranger Distress Oxides. I used a little regular distress ink as the oxides don't have any really pale colors. I've used almost all the techniques in this card, too. Originally I was using plain white paper for inking the background. Then I thought that bookpaper would make a much richer look and really go with the images in this set. For a variety of bookpapers check out my packs at Lovely Layers Art. The flower is Prima and the cardstock is Dark Chocolate from Papertrey Ink. I really love that stamp set and how you used it. 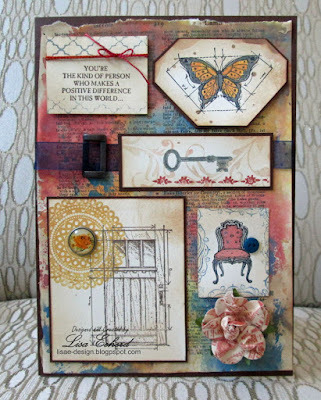 Great job showcasing the Distress Oxide inks too. I bet your mum will love that card. Capturing our memories in scrapbooks and creating cards are passions I love to share through my blog and YouTube videos. Thanks for visiting. If you find inspiration here, I'd be honored if you subscribed or followed my blog. Copyright 2009 Lisa Echerd. The material here is presented for your inspiration. All photographs and content are the property of Lisa Echerd. Stamped images are the copyright of the manufacturer.